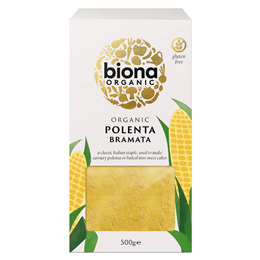 Biona Organic Polenta Bramata is made with cornmeal. Easy to cook in approximately 30 minutes. Serve with oven roasted vegetables, cheese and fresh herbs. Buon Appetito! Bring water to boil. Reduce to simmer. Pour in polenta steadily, stirring constantly. Continue to stir until polenta is thickened. Cook for approximately 30 minutes. Polenta can be served as a side dish or alternatively spoon polenta into an oiled tray and smooth out. Allow to cool, then cut polenta into slices which can be pan-fried or grilled before serving. 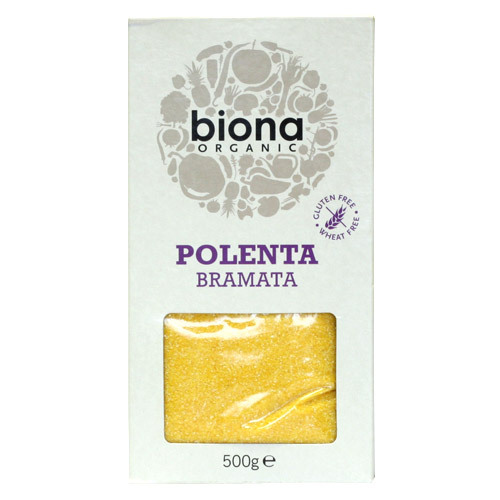 Below are reviews of Biona Organic Polenta Bramata - 500g by bodykind customers. If you have tried this product we'd love to hear what you think so please leave a review.